What makes the best dog food for puppies? Marketers have made working out what's healthiest for your puppy so confusing. Here's how to determine the healthiest dog food for puppies. Puppies require at least 22.5% protein (on a dry matter basis). A high-quality protein provides the essential building blocks for muscles and organs. But not all protein is created equal. Dogs do better on high-quality animal protein. Plant-based protein is cheaper but not as easy for your pup to digest. The best dog foods for puppies have a specific animal protein as the first ingredient and no cheap plant-based concentrated protein. Puppies use a lot of energy to grow, explore the world and make us laugh. The best energy sources are from specific animal fats. The minimum amount of fat required for puppies is 8.5%. High protein and fat together also help your puppy feel fuller for longer. This also leaves less room for carbohydrates. Carbs are not a great source or energy and puppies don’t require any for healthy growth. The best dog foods for puppies pay very close attention to Omega Fatty Acids. Getting the right ratio between Omega 3 and 6 ensures healthy brain development as well as being vital to skin and coat. Be wary of vague labelling that can suggest low-quality ingredient sourcing (e.g. fish oils) and seek specific cold water fish like Salmon that provide the best sources of DHA & EPA (Omega 3’s). Most commercial dog foods will have healthy levels of salt for all life stages, but some might not have enough for growing puppies. Puppies require at least 0.45% salt in their food. Be careful that they’re not adding too much as some brands add a lot to improve taste. Did we mention we have just the food for them? Puppy parents around Australia are getting them started on Scratch. We said no to dog food stores and yes to real ingredients, made fresher on subscription and delivered to you. 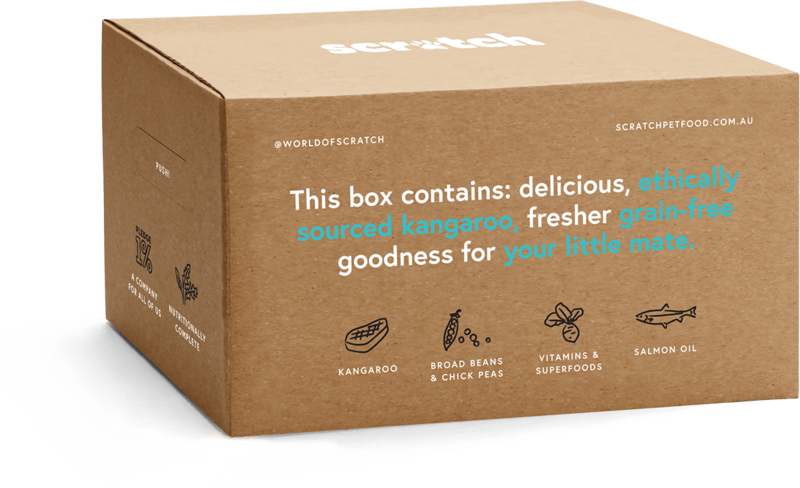 Our Scratch dog food is a premium puppy-friendly food with the right amount of salt, premium Kangaroo protein, healthy beef fats and plenty of DHA from both algae and Salmon Oil. Sourced, made, and owned right here in Australia. We mix everything together in New South Wales using 97% locally-sourced ingredients. That 3%? That's coconut oil & vitamins we get from o/s to give him a boost that products grown in Australia can't. We fine-tuned our recipe with an animal nutritionist to make sure every ingredient was spot on and mighty delicious. We use data to know what your dog needs and when they need it. The subscription model means no more late night dashes to the supermarket. Just fresh dog food delivered to your door without any artificial preservatives. Everything your mate needs – nothing they don’t. Premium kibble for healthier skin, a shinier coat, a stronger immune system, and all the energy to chase down some magpies. Free from artificial preservatives, dodgy meats, and cheap ingredients. Skip the scare tactics and huge product ranges, this is the ultimate dry dog food for nearly all ages and all life stages. You will generally start with feeding your puppy 3 or 4 meals per day and reduce to 2 as they mature. With this many feeds per day and with a puppy that’s getting bigger each day it is hard to know how much to feed them and the back fo the pack is too hard to understand. With Scratch, you get a personalised feeding guide. As you update your dog's weight and age you receive a new feeding guide for your pup. It is important not to overfeed your puppy as excess weight increases the risk of many muscular-skeletal problems. Scratch is great for all puppies except for large breed puppies (woofers who are expected to weigh over 30 kilograms as an adult). Large breed puppies have very specific requirements to allow them to grow healthily and to reduce the risk of developmental orthopaedic diseases. Scratch has a touch too much calcium than suggested for large breeds which grow rapidly in their first year. Once they reach adult size then they can join the pack. Small and medium sized puppies? Welcome to Scratch! You won’t find generic names that could mean any part of an animal. We only use real names for real ingredients and tell you exactly how much of it is in there. Just hover over any ingredient below to understand why we use it. Doesn’t have a percentage shown? That means it is included at 1% or below. Small, but important! Kangaroo is our main protein source. It’s high-protein, lean, great for dog's with allergies and free of added hormones. Great source of protein, fibre and vitamins & minerals. "I guess veggies are ok…. As long as it means it is Grain Free, Soy Free and not carb filled potatoes or tapioca either." Great source of protein, fibre and complex carbs. Plant extract to help reduce stool odour. "Me, trying to be nice to my Poo Slave"
Natural Source of Vitamin A & Beta Carotene. "Carrots help me see better right? All the better to see you with!" Antioxidants, Vitamin K & Iron. "Soo much tastier than Kale"
Source of Curcumin, a powerful antioxidant. "Like a daily Golden Latte. When is our next trip to Bryon, or Brunswick Street at least?" Great tasting source of energy. "Can I pleassse lick the bowl?" Excellent source of Omega 6 to help maintain healthy skin and glossy coat. "Shinny fur helps me get my strut on at the park"
Tasmanian Salmon oil is a great source of Omega 3 EPA & DHA to support brain development in puppies. Concentrate source of energy that helps maintain healthy skin. "This is paleo right?" Needed for healthy bone development. Salt is required to maintain the electrolyte balance, organs and nervous system. Important for healthy skin and coat as well as immune system. "Having good skin = more belly rubs"
Concentrated supplement of vitamins and minerals to ensure that your woofer has everything he needs to thrive. Bet you can't say them in one breath! - Choline chloride, Calcium carbonate, Zinc sulphate, Vitamin E, Ferrous Sulphate, Vitamin C, Copper Sulphate, Vitamin B3 Niacin, Vitamin B5 D-Calpantothenate, Vitamin B2 Riboflavin, Vitamin A, Vitamin D, Vitamin B12 Cyanocobalamin, Vitamin B1 Thiamine, Selenium, Manganous oxide, Vitamin B6, Pyridoxine, Potassium Iodide, Vitamin B9 Folic Acid. Vitamin E and other natural mixed Tocopherols combine with Rosemary Extract to make sure bacteria doesn't build. If your mate isn’t into Scratch, we’ll give you your money back. Not into it? We’ll refund you.